Recently, the demand for our golf turf services has increased significantly, and this is mainly due to the fact that our services are second to none. George Davies Turf only purchase the best turf available, while our extensive knowledge on different turfs means we know how to look after it and load it, ultimately eliminating any risk of damage. We also offer a prompt and reliable service, whilst only selling at fair and affordable prices. Golf turf pallets can be loaded into a trailer, meaning we can place them next to the prepared tees or greens. 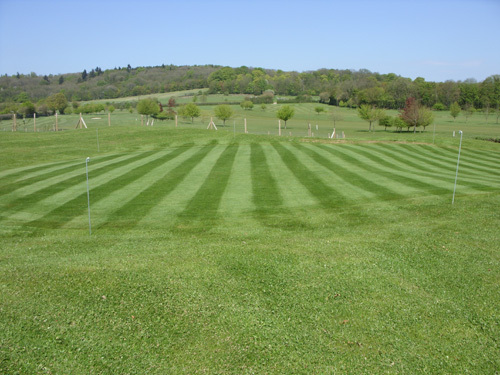 We have a variety of turfs suitable for golf courses. Greenscape turf is a mixture of Fescues, Smooth Stalked Meadow Grass and Dwarf Perennial Rye Grass; making it suitable for tees. For those that want golf turf that is not rye based, we can provide Smooth Stalked Tees. It recovers well and has a better tolerance to close mowing, while County Greens Turf is made up of Fescue and Bent Greens Turf, making it ideal for golf courses as well as bowling greens. We also have a new Bargold product, which is a fine leaved rye grass based turf, suitable for fine tees. We’ve been providing first class golf turf since 2001, and we’re always happy to share our opinions and help you decide on the turf best suited for your project. We now supply turf to over 35 golf courses, including Woburn and Moorpark. If you require golf turf or want to find out more about what we can offer, then call George Davies Turf today on 01234 714555.